A Bristol model making and puppet animation studio. Bigfatstudio have created 3D puppets for commercials and films for more than ten years. They were the producers of Vinny the Ch4 film animated by Subvision and our company subsequently created their website. A London based financial company, County West wanted a clear and simple design. 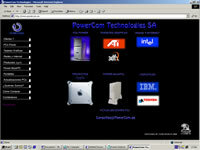 Another Barcelona based IT company that took our expertise in promoting and designing it's site.